Nearly a quarter-century has passed but Kumar M. Desai still remembers the incident that sowed the idea of "green elevators" in his entrepreneurial mind. A pregnant woman had to be taken to hospital from her eighth-floor apartment but the elevator was not functioning because of a power cut. 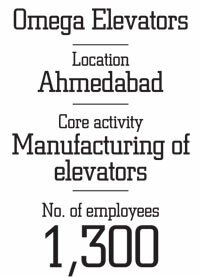 "We put her in the elevator, asked more people to get in, and mechanically released the brakes to bring the lift down with the help of gravity," says Desai, founder of Ahmedabad-based Omega Elevators. That episode led him to explore ways of running an elevator on off-grid electricity generated from solar energy. "But the technology was unreliable and batteries were very expensive," he says. He did not give up. Finally, in 2006, Omega started making elevators that run on wind and solar power. It has installed 80 to 100 such energy-efficient elevators so far. Omega, whose competitors include multinational giants such as Schneider, KONE, Otis, Mitsubishi and Hitachi, is now pushing its customers to instal LED lights in elevators to save energy. Overall, Omega has installed 30,000 elevators since it began operations in 1986. "Selling my first elevator was hard. I charged a builder in Ahmedabad 10 per cent more than my competitor but delivered it faster," says Desai. "That elevator is still functional."